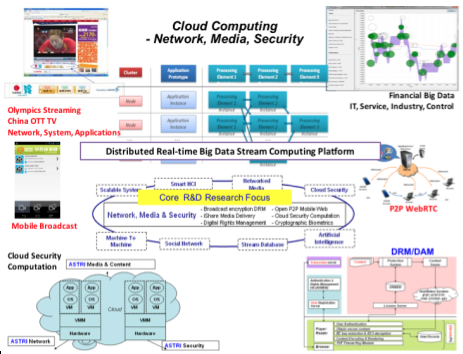 Built on top of multi-disciplinary research and development in network, media, and security, Cloud Computing Group (CCG) provides high performance large scale distributed computational platform with efficiency, reliability, performance and flexibility for a range of cloud computing applications from media broadcast, digital rights management, cloud storage, network virtualization, P2P webRTC (real-time communication), to intelligent demographics, Internet Finance and financial trading applications. CCG’s core computing engine builds upon innovative distributed load balancing PE (processor elements) with dynamic expansion/shrink, load shedding, and complex event processing. It has built-in scalable and distributed statistics computation algorithms aiming at multi-modal data processing, pattern recognition, and machine learning for large stream data sets. 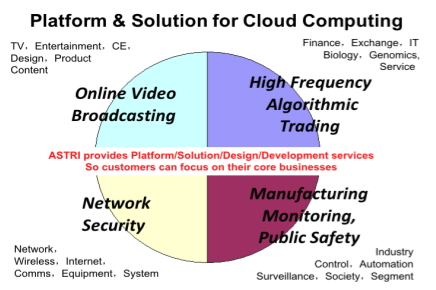 CCG team provides system, platform, solution, and consulting services so that the customers can focus on their core businesses.